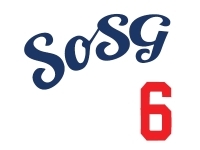 Those of you who have followed Sons of Steve Garvey over the past seven and a half years know that the Sons of Steve Garvey have never retreated from a challenge, when it comes to providing insightful, sarcastic, fan-perspective coverage of the Los Angeles Dodgers team we love so dearly. We've braved Opening Day crowds almost every season. We've brought you hand-crafted insights from private events, the clubhouse, and the dugout--even covering the Dodgers as press on a road trip. We've suffered through the inane rhetoric of sessions with Frank McCourt. We've even taken you inside the secret urinal rooms of Dodger Stadium. And now, Sons of Steve Garvey is taking it up one hell of a serious notch: We are sending a team of two Sons to cover the Dodgers' Opening Series in Sydney, Australia. That's right, SoSG Sax and AC are both braving boomerangs, wallabies, and vegemite in order to bring you the up-close-and-personal fan perspective from a cricket ground almost 8,000 miles away. 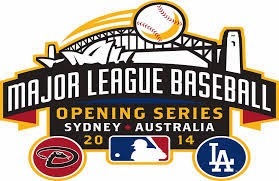 Can the Dodgers beat the Diamondbacks down under? Will Sax and AC run into Trent Oeltjen (below, doing his "waltzing matilda" stage musical routine back in 2011)? Does the toilet water flush in the opposite direction? Is the Qantas entertainment system robust enough to handle two 16-hour flights? Over the years of this blog, us Sons have been very fortunate to have minted a princely sum of revenue, so we figured we'd go nuts for this 2014 season and splurge (also, we too had "safety" as the first play of the Super Bowl in Vegas). Keep this channel bookmarked March 22 and 23 (or 21 and 22, from your perspective), SoSG fans. 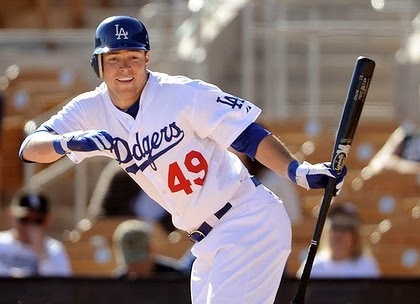 So while other blogs shift homes, we will make sure you get every second of Australian Dodgers baseball action covered. It can't be THAT cold in the cargo bay, right? Cargo Bay, great snorkeling there! Make sure to turn the camera or iPhone upside down so the pictures will look correct here in the northern hemisphere. Watch out for the dingo. Can't believe you're both up for such a long trip - can't wait to read the live coverage! Hopefully with some cricket references thrown in, and a Simpsons-in-Australia episode-themed GT thrown in. Somebody here knows something about Australia: vegemite, God help us. Yep, Sax was fired by the Dbacks and won't be returning as first-base coach. That's a Flaming Menudos case you are thinking of, FB.